Born and raised in Tigerville, SC, Michel was perhaps inspired creatively by his mother. 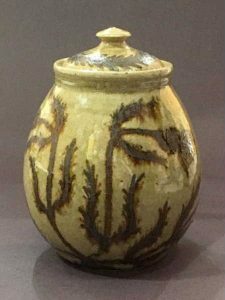 He began making pots just after finishing high school and continued playing with clay as a hobby for twenty-five years while working in heating and air conditioning. In 2003, in response to arm surgery, he was no longer able to work in his chosen trade and began to pursue pottery as a livelihood. Michel makes his own glazes, mostly traditional alkaline glazes, and fires in a wood-fired kiln. He evolves traditional incising design or colored slips to a more complicated level of detail. His merging of tradition and ingenuity recently afforded him a nationally prestigious award as a traditional artisan in 2009’s Directory of Traditional American Crafts. Michel’s face jugs are very distinct. He uses a traditional technique of adding clay to the outside of the jugs; however, he has created a quite remarkable alternative process, hand-carving and manipulating the face from within, creating a profoundly refreshing beauty, from the inside out.